Educational and public spaces include an auditorium with seating for 220, a library, learning spaces, observation and interview rooms, numerous conference rooms, children's work and play areas, as well as offices for more than 80 researchers, post-doctoral fellows, doctoral and master's students, and research clinicians. 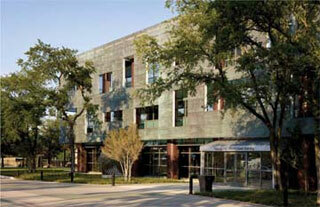 Profile: The three-story Center for Brain Health is a modern research center near downtown Dallas. The facility is exclusively dedicated to studying the brain in order to strengthen its lifelong critical functions. As many as 50 medical research projects will be ongoing at any given time, ranging from neuroscience breakthroughs, to studies about stroke, Alzheimer's and Parkinson's disease, traumatic brain injury, normal aging complications, and psychiatric diseases. Additional spaces included a large auditorium, library, observation rooms, and conference spaces. Services: DataCom Design Group provided acoustical consulting services, testing and system commissioning of the acoustical recommendations. Noise-induced stress and sleep interruption of patients can impact treatment and could potentially skew results of sensitive research being conducted at the Center. Communication between doctor and patient can be reduced by inadequate privacy or noise distraction. DataCom Design consultants addressed HVAC and mechanical noise control in the facility to prevent the escalation of noise that has been a concerning trend in a number of healthcare facilities.